China is a global powerhouse within international higher education. Its well-known dominance as the top sending country of international students positions it to have outsize influence on higher education policies and funding around the globe. Intentionally developed through a series of initiatives, partnerships, and strategic plans both domestic and international, China’s significance as a recipient of globally mobile students could match or exceed its relevance as a source of international students within the next few years. With its growing influence as the largest sender and third-largest recipient, China is the prime mover of international mobility trends globally. While China’s influence as a sending country is most commonly discussed, the methods China has used to achieve its significance as a host country warrant exploration. This article examines the strategic economic, political, and educational initiatives that have broadened China’s sway in global mobility trends in recent years. Over the last decade, China has implemented a multitude of initiatives and policies—some directly related to education and some tangentially—that has contributed to its success and growing popularity as a destination for international higher education students. These strategies include the Belt and Road Initiative (BRI), joint education programs, intergovernmental education partnerships, billions invested in China-Africa relations, the proliferation of Confucius Institutes, China’s National Plan for Medium and Long-term Education Reform and Development (2010-2020), and relaxed work policies for international students. These initiatives—some of which have elicited both praise and criticism—have been effective in securing China’s ascendancy as a host country. China’s influence on international higher education as a receiver of students has been increasing for the past several years. In 2011, China moved ahead of France to become the third-largest recipient of international higher education students, according to data from IIE’s Project Atlas. Since that time, China has steadily closed the distance between itself and the United Kingdom—the second top host country—from a gap of about 188,144 students in 2011 to just 58,272 in 2017. If it continues along this trajectory, China will likely overtake the UK for the No. 2 spot within the next two or three years. The top three countries of origin that send international students to China are South Korea, the United States, and Thailand, according to the Center for Strategic & International Studies (see Figure 1). In 2016, South Korea sent nearly triple the number of students as the number two country; South Korean students made up 16 percent of all international students in China. Students from the U.S., China’s second top sender, made up only 5 percent of all inbound international students in China. The remaining top 10 countries sent students that made up between 2 percent and 5 percent each. The percentages from these varied countries mean that China has a fairly diverse international student body—in sharp contrast to the U.S., where students from China and India made up a full 51 percent of all international students in 2017/18. The effort has approximately USD$900 billion in allocated funds, with much of that focusing on infrastructure. For projects under the BRI framework, China contributes a certain amount of money, and the partner country supplies the rest. BRI has been criticized as “creditor imperialism” or “debt trap diplomacy” because of the large loans that China provides to BRI countries that do not have the necessary funds—loans that some countries may not be able to pay back. Nevertheless, BRI has proven to be politically effective. China signed 50 diplomatic cooperation agreements through BRI in 2017 alone. These 50 agreements make up almost half of all diplomatic agreements signed by China since 2012. According to a 2018 World Bank brief (which included China and about 65 other countries in its calculations), BRI countries “account collectively for over 30 percent of global GDP, 62 percent of population, and 75 percent of known energy reserves” in the world. The intergovernmental project directly influences higher education through earmarked funds for joint education programs. It has helped to foster thousands of cross-border relationships between Chinese higher education institutes (HEIs) and those abroad. The project supports the country’s explicit goal, as laid out in its 2010–2020 educational reform plan, that “schools at all levels … should be encouraged to engage in diverse forms of international exchanges and cooperation, and a good job should be done in running demonstrative joint schools … in cooperation with foreign partners.” China’s Ministry of Education closed 234 of these transnational programs in 2018 (after all enrolled students finished their course work) as a regulatory control effort to address quality concerns, the public was told. In addition to developing cross-border HEI partnerships, China has also been constructing strategic education partnerships with foreign governments. An example is the Belarus’ Year of Education, which will take place throughout 2019 and comprises “institution building, publicity campaigns, training, contests, seminars, and youth exchanges.” In a similar vein, China signed an agreement with Indonesia in 2017 for higher education credential recognition between the two nations. BRI appears to have influenced both inbound and outbound student mobility in China. According to China’s Ministry of Education, the number of students from participating BRI countries increased by approximately 12 percent in 2017 from the previous year, and made up a staggering 65 percent of all international students enrolled in the country. Year-over-year inbound growth of international students from BRI countries has increased at a consistently higher rate than inbound growth from non-BRI countries (see Figure 2). Likewise, more Chinese students are pursuing their education in BRI countries. BRI destinations have seen a nearly 16 percent growth rate of Chinese students since 2016. Figure 2 Source: WES constructed this graph from data found at the China Center for Strategic & International Studies website. *WES determined “BRI countries” to be the 130 nations listed on China’s Belt and Road Portal. China’s increasing political and economic ties with African nations have influenced student mobility as well. China is now second only to France as a study destination for African students. While some African countries fall along the New Maritime Silk Road and are therefore part of BRI, the ties between Africa and China go beyond the BRI initiative. These ties are generally rooted in infrastructure development; however, education plays a significant role as well. At the 2018 FOCAC (Forum on China-Africa Cooperation) Beijing Summit, President Xi Jinping outlined eight initiatives to strengthen ties between the nation and the continent. In his speech at the opening ceremony, he stated: “China will extend USD$60 billion of financing to Africa in the form of government assistance as well as investment and financing by financial institutions and companies.” The fifth initiative he discussed pledged multiple education supports, including the establishment of 10 Luban Workshops (which offer technical and vocational education training) in Africa; a China-Africa innovation cooperation center for African youth; 50,000 government scholarships; and 50,000 training opportunities. These wide-ranging proposals continue a trend of African student and scholar support. The Chinese government funded 40,000 scholarships from 2011/12 to 2016/17 and established 200 placements for African scholars. In addition, China has established 48 Confucius Institutes—which promote Chinese culture and language—in 33 of the continent’s 54 countries as of 2017. South Africa has gone so far as to include Mandarin Chinese in the country’s curriculum. 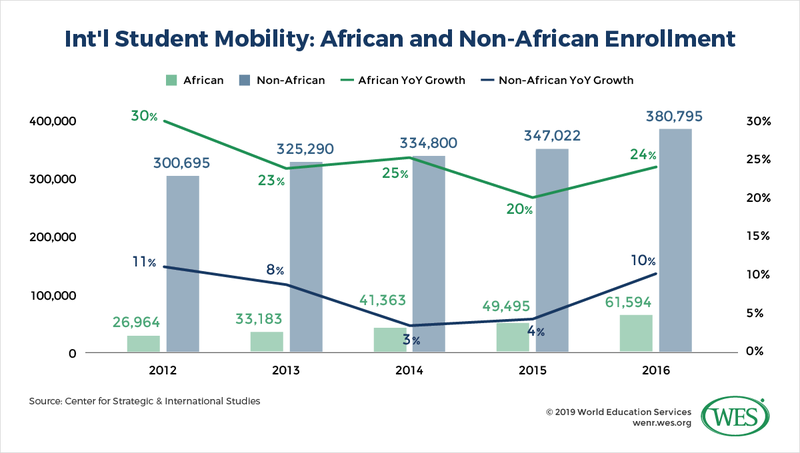 The intertwining economic and educational ties of the Sino-African relationship are almost certainly contributing to shifting trends in international student mobility. In fact, the number of African international students in China grew 3,335 percent between 2003 (1,793 students) and 2016 (61,594 students). From 2012 to 2016, the rate at which African students are enrolling in Chinese HEIs has consistently grown faster than that of students from other regions. In 2016, it showed 24 percent year-over-year growth, a full 14 percentage points higher than non-African year-over-year growth (see Figure 3). In addition to developing initiatives and strategic ties with other nations, China is bolstering the appeal of its own education system by allocating increasingly higher funds to educating international students. The country has also relaxed its employment policies to attract students from abroad. China’s growth in international student numbers is aligned with and partially driven by the country’s education improvement plan. China’s explicit goals of admitting more international students (as a way to increase China’s soft power) and of improving its education systems are laid out in China’s National Plan for Medium and Long-term Education Reform and Development (2010-2020). In 2018, two of China’s universities (Peking University and Tsinghua University) were ranked two of the top 30 in the world in the Times Higher Education World University Rankings. China has set its sights on more ambitious targets, however, and is endeavoring to place 42 universities in top rankings by 2050. Along with making improvements in quality, China is also expanding its course offerings. More and more international students are “pursuing non-language degrees,” made possible by the increased number of programs offered with English as the language of instruction, a further draw for many students. In 2018, more than 100 HEIs in China offered courses in English—nearly triple the number offered in 2009. In tandem with the quality benefits it offers, the Chinese government is increasing funds and scholarships for international students. China’s low cost of living already provides an appealing financial incentive to students considering learning abroad, and scholarships are another. In 2018, China’s Ministry of Education dedicated USD$469 million to inbound students, an increase of about 16 percent over the previous year. Approximately USD$300 million of that budget is used for scholarships each year, and in 2017, approximately 12 percent (58,600) of all international students within China received a scholarship from the government. This is a drastic increase from 2006, when only 8,500 international students were awarded scholarships. The Chinese Government Scholarship and the Confucius Institute Scholarship are perhaps the most notable scholarships available to international students, but province-based scholarships, such as one in Jiangsu and another in Beijing, also support students from abroad. China’s status as the top sender and No. 3 receiver of international students imbues the country with significant power—perhaps even the most power—to shape global mobility trends within higher education. It is important to take note of how China has become so successful as a host country. The world is witnessing a proliferation of internationalization plans—including those of France, Russia, Japan, and the UK—and many nations have experienced success. However, arguably no other country has seen its internationalization goals come to fruition as quickly and on as large a scale as China. China is seeing its inbound international student population multiply so swiftly, in part, because it does not “silo” or isolate education. Rather, it has linked its education sector to its economy and geopolitics and thrown the full weight of the Chinese government behind large-scale, inter-sector projects. China’s dominance within student mobility is a result of the dynamic relationships between sectors. Though different sectors are regularly discussed as disparate, in reality they are often so closely intertwined as to be indistinguishable at points. By instituting strategies and initiatives that span sectors, that cross borders, and that exist at various scales, China has reached high-ranking host country status. As mentioned earlier, though these initiatives have earned China both praise as a leader in development and criticism as a colonial power, they appear to be effective. Quite simply, China has developed a comprehensive strategy that goes far beyond linear or segmented internationalization schemes, carving out instead multiple streams that extend in numerous directions, all coalescing to guide students in and out of its borders.